Encourage public involvement in the land-use decisions that determine the livability of Rogue Valley communities. 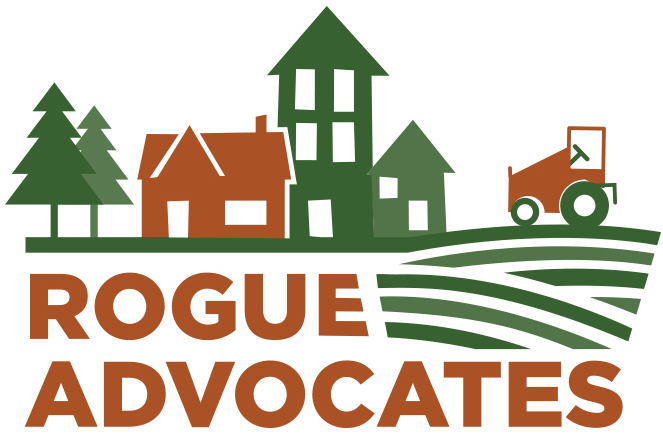 In order to help citizens participate effectively in Oregon's complex land-use planning system, Rogue Advocates provides information and guidance about the decision-making process, and assistance with issues of particular importance. Provide education about the value of a strong identity with the land and a need for healthy natural systems, and to convey the message that high quality of life and a prosperous economy depend upon a healthy environment. Our goal is stewardship: a visionary belief that values public input, civic responsibility and a long-term perspective on how we use our land. Highlight the necessity for well-informed planning in order to maintain livable communities. The cumulative effect of unregulated development causes overcrowding, pollution, traffic congestion, and ruins the very attributes of the Valley that drew people here. Facilitate understanding of Oregon's land use planning system in order to protect our state's (and our Valley's) livability, open spaces, highly productive agricultural and forest lands and its status as an environmental pace-setter.